Orangutan Land Trust is a member of the Roundtable for Sustainable Palm Oil, and very active in efforts to ensure that the palm oil industry works as sustainably as possible. We have helped to develop the new Guidelines for New Plantings Procedure for the RSPO which will help companies wishing to become certified sustainable to achieve this goal. OLT voluntarily serves on the Principles and Criteria Review Taskforce 2017/18, the Biodiversity and High Conservation Value Working Group and the Complaints Panel for RSPO. Previously, Orangutan Land Trust participated in the Taskforce for the Review of the Principles and Criteria 2013 of the RSPO, and introduced new indicators for the protection of wildlife. We also served on the Dispute Settlement Facility Advisory Panel. 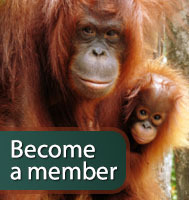 Orangutan Land Trust are also members of the Palm Oil Innovation Group, which builds upon the standard of the RSPO. Orangutan Land Trust has served as a consultant to the World Bank on the issue of palm oil and to numerous companies and institutions as well. We helped to develop the Responsible Palm Oil Network of Australasia. We support investigations into illegal and conflict palm oil as well as orangutan rescues from such areas. Through our Sustainability Partnerships, we promote responsible production, trade and sourcing of palm oil. The PONGO (Palm Oil and NGO) Alliance is an initiative of the Orangutan Land Trust, bringing together some of the biggest players in the palm oil industry and NGOs and conservation experts to develop strategies for the management and protection of orangutans and other wildlife within an oil palm landscape.